Magnus Carlsen of Norway, the three-time defending world champ and world No. 1, is looking for a fourth crown. Fabiano Caruana, the U.S. challenger and world No. 2, is trying to become the first American to claim the world title since Bobby Fischer in 1972. It’s the first time since 1990 that the world’s two top-rated grandmasters have met in this match — but it’s been a bloodless battle thus far. 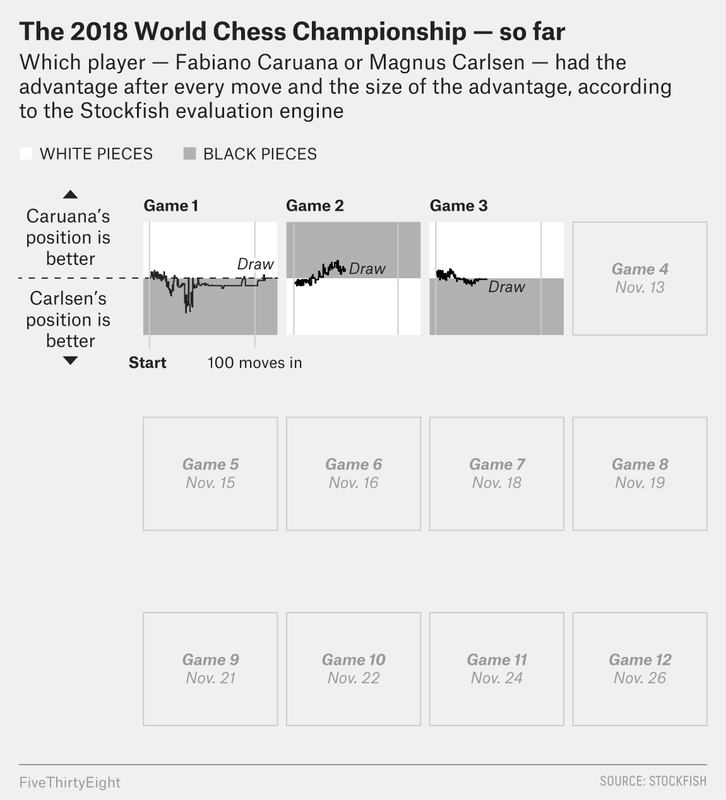 On Monday, Caruana controlled the white pieces and Carlsen the black. The pair began Game 3 with an opening called the Sicilian Defence, specifically its Rossolimo Variation. It was the same opening they played in Game 1 — which ended in an epic seven-hour draw — and the first five moves exactly matched those from that earlier game. But they deviated dramatically from this familiar ground on move 6, when Carlsen moved his queen to the c7 square. Caruana glanced around the soundproof glass room in which they played, looking slightly befuddled. A quick word on this opening’s eponymous Rossolimo himself seems warranted, given that Monday’s game was lacking in fireworks and Rossolimo’s name has figured more prominently thus far in this world championship than any but Caruana and Carlsen. He was Nicolas Rossolimo, Renaissance man: one of the U.S.’s 12 grandmasters at the time, fluent in Russian, Greek, French and English, and the “proprietor of a chess studio,” which became a second home to some players. He was also a judo master and a New York City cab driver and recorded an album of Russian folk songs, according to The New York Times. He died in 1975 after a fall near the storied Marshall Chess Club in Manhattan. Magnus Carlsen ponders his next move against Fabiano Caruana during Game 3 of the 2018 World Chess Championship. Back to Monday’s chess: On his 13th move, Carlsen pushed his black pawn forward to a5. Pieces were exchanged on that square over the next few moves, and the queenside became wide open — a vast Wild West of squares marauded by rooks and queens. But by this point in the game, only 17 moves deep and with plenty of firepower remaining on the board, the chesserati was assessing the game as headed straight for a draw. (Pro tip: If you want to sound smart about a championship chess game, just say it “looks drawish.”) In this case, they were right. 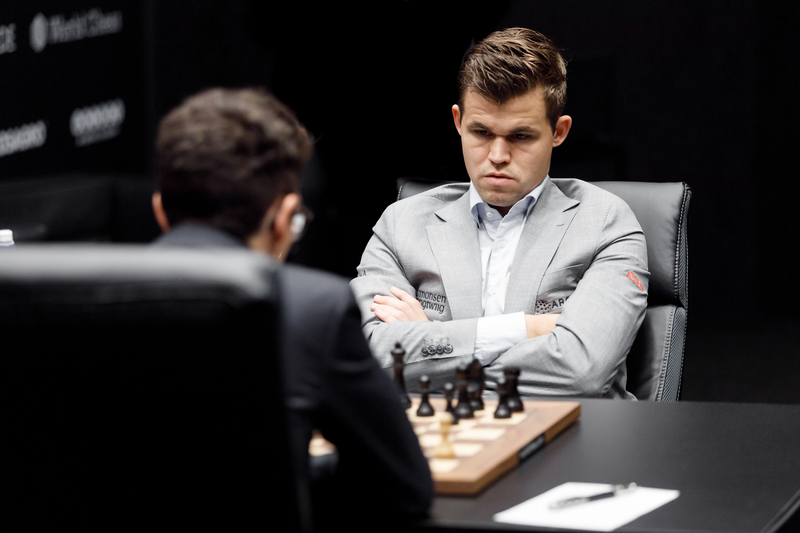 The powerful pieces on the board’s western side were liquidated, and Caruana and Carlsen agreed to a draw after the 49th move and four hours of play. There is another figure, aside from the colorful Rossolimo, casting its shadow over this championship: The Computer. Most livestreams of the match feature instant computer engine analyses, whose cold numbers instantly assess the humans’ tiniest inaccuracies down to hundredths of a pawn. Those judgments ripple through the commentary. Full disclosure, I rely heavily on a chess engine running on my laptop to aid my understanding as I watch the games. One popular site during recent world championships features live analysis showing arrows pointing out a supercomputer’s favored moves. The principals in the match have also commented on The Computer’s somewhat spooky influence. “It’s like you’re playing against a phantom,” Judit Polgar, a grandmaster providing official commentary on the match, said today. The Computer can often seem like a phantom, a specter haunting the games. It can seem like an overlord that has rendered the human game obsolete and small. But it’s important to remember that man made the machines. Garry Kasparov lost to the supercomputer Deep Blue, but a team of humans sweated and bled to built it. In these technological gaming battles, man plays two roles: builder and performer. At the world championship in London, we are witnessing the performance of two of the best players in the history of the game. That stronger computers exist, and have helped Caruana and Carlsen get to London, does not detract from their feat. Here is how — ahem — a computer has seen the championship so far, move by move, cold computation by cold computation. We’ll keep the chart below updated throughout the match. Game 4 begins Tuesday at 3 p.m. Greenwich Mean Time — that’s 10 a.m. Eastern. I’ll be covering it here and on Twitter. Wins are worth 1 point, draws 0.5 points and losses 0 points.